Look It's Megryansmom: Write Pink! Happy October and Breast Cancer Awareness Month ! Today is also Blog for your Breasts Day. In the United States, one in eight women will develop breast cancer at some time during her life. Before 2010 comes to a close, over 207,000 new cases of invasive breast cancer and over 50,000 non-invasive cases will have been diagnosed in this year alone. The disease even affects men, about 2,000 of them. Even with those scary odds, there is hope on the horizon. Early diagnosis comes from monthly breast self-examinations and annual mammograms. Self-examination will make you aware of any changes in the breast. If you notice such changes, please make an appointment with your doctor. Talk to your doctor about mammograms and other screening procedures for detection as well. These technologies can find the tiniest nodules which the most sensitive fingers can miss. Do all you can to prevent development of the disease. Then do all you can to detect it as early as possible. Please sign the pledge at Army of Women to help recruit ONE MILLION HEALTHY WOMEN to participate in research studies aimed to prevent breast cancer and to find a cure. 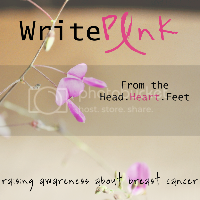 Visit Bigger Picture Blogs as they kick off Write Pink! from the Head, Heart and Feet, where bloggers will share stories of survival, support, and prevention. You can make a difference, together we can help find a cure in our lifetime. Rita, it's so good to be writing pink right along side you this month! AOW is doing such amazing work, and I, for one, am so glad to be alongside some beautiful women like you who are making it all possible. Thanks alos for working with us to help spread the word by volunteering to write a post for Write Pink. Love that you are writing pink! Rita Placenta, I love the fact that even though you are as busy as a one armed paper hanger, you still do good with your posts.